Pyloric stenosis refers to a narrowing of the passage between the stomach and the small intestine. 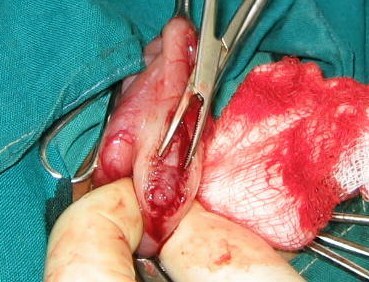 The condition, which affects infants during the first several weeks of life, can be corrected effectively with surgery. The main symptom is vomiting after feedings. Other symptoms include increased appetite, weight loss, infrequent bowel movements, belching, and diarrhoea. Due to dehydration, the infant may also have fewer wet diapers. Statistical Analysis of pyloric stenosis in India got the results as 89 male and 12 female babies ranging in age from 12 days to 4 months (mean: 43.4 days) were operated upon during this period. The babies ranged in weight from 1.8 to 4.7 kg (mean: 3.1 kg). Four cases were converted to open (3.9%): three due to mucosal perforations and one due to technical problem. The mean operative time was 45.7 minutes (49.7 minutes in the first 3 years and 43.0 minutes in the next 3 years). There were 10 complications-4 mucosal perforations, 5 inadequate pyloromyotomies and 1 omental prolapse through a port site. All the complications were effectively handled with minimum morbidity.